Patrick Pham’s collection during Paris Haute Couture Fashion Week favors dresses with movement, captures freedom and radiates luxury. His bold hues are lightly sculpted and shaped for the curve of the female figure. The bold hues of red and cobalt blue work flatter the confident woman. A long blazer dress paired with shorts takes a traditionally formal look from the office to the daytime outing. The interesting pairing emphasizes the intense red hue and unconvnetionally feminine cut. The ensemble suggests a strong woman, unafraid of the unknown — especially in fashion. Pieces can be worn separately to give the outfit variety. A long blazer open over jeans, or a flowy blouse over shorts. Bold colors and stripes separate Pham from other designers. Colors from Pham’s childhood inspire this season’s collection. As seen in the colbalt blue ensemble, suits are youthful. What a great example of power dressing: sophisticated suits that could travel on a lavish cruise ship getaway or give you the freedom to be the woman in the public eye. Two-piece monocramatic sets offer a ladylike approach to suiting. We appreciate the elegant way it orchestrates a complete and cohesive ensemble. This extends to sportier versions, too. Pham adds monochramatic accessories like the belt bag and silk joggers to keep the look youthful and fresh. Pham’s collection pairs edgy shrunken monochromatic blazers with ankel skimming trousers. These abbreviated, sharp cut jackets look cool — and quite versatile. I can imagine pairing one of these cropped suit jackets over a white tee to understate the look for a more casual setting. 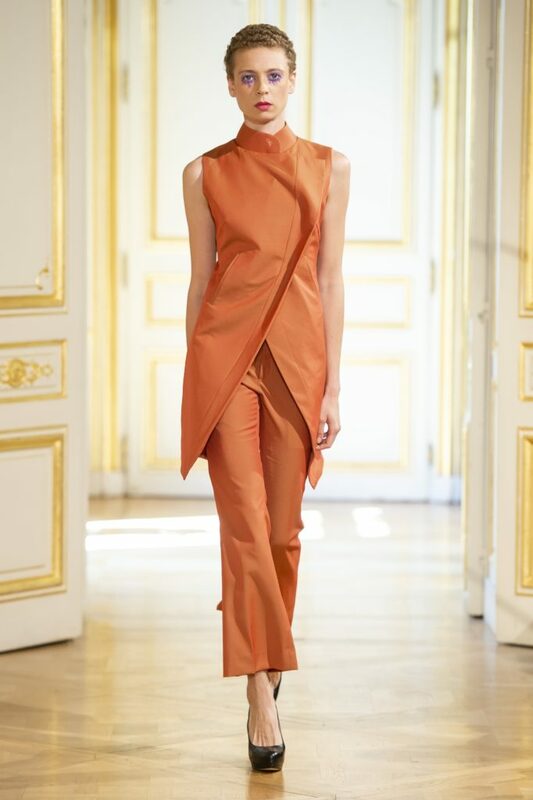 Patrick Pham’s monochromatic looks during Paris Haute Couture Week portray confidence. The empowering part? Pham knows how to create clothes women actually want to wear. We want to snap up these figure flattering styles right now.